autumnal › Buy Poster of Beautiful young woman with very long red hair in a golden medieval dress walking through the autumn forest. Long red hair develops in the wind. Creative colors and Artistic processing. 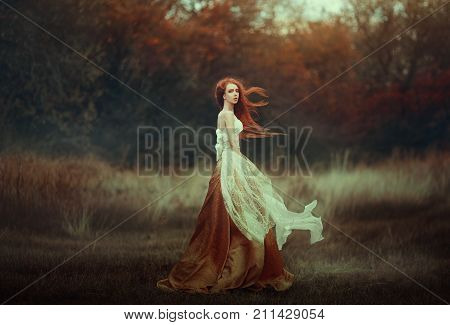 Poster of Beautiful young woman with very long red hair in a golden medieval dress walking through the autumn forest. Long red hair develops in the wind. Creative colors and Artistic processing.